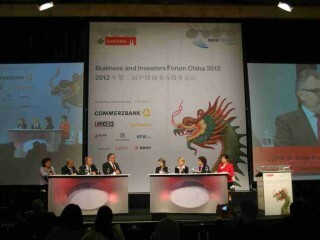 Basic differences – observing managers on stage while joining a panel discussion at the China-Germany business forum in Cologne 14th of September in Cologne. You can at once realize basic obvious differences in behavior patterns. While the Chinese managers mostly directly face the audience or the moderator answering their questions, German managers more often look around to the audience, the moderator, the other managers on the panel and back. They instead of the Chinese managers take the panel and the stage as a space where they move around by looking. Answering the questions changes into a scenario of a visual dialogue. This dialogue is supported by a rich facial expression. Chinese managers instead of this more often look ……….at some imaginary fixed point in the audience. Their facial expression mirrors a reduced expression, though they seem to be in direct contact to the audience. Observing these different habits of behavior patterns on the panel one could think that the German managers tried to present themselves by presenting their answers as well as they tried to make contact to the others on the stage. The Chinese managers sometimes answered the eye contact but mostly without any obviousspecific facial expression. To put it metaphorical the German managers seem to be in a state of advertising whereas the Chinese managers mostly stayed in a state of being there and pointing out there position. Western managers are quite familiar with the guidelines of rhetoric and body-language while presenting and performing on a panel. Of course they know about stress and the function of stress and the resonance of stress to the audience. Unconsciously this resonance, this echo put quite a big pressure on the manager. On the other hand this perspective has quite a big influence on the audience. If the manager shows less stress the audience of course will be more open to the content (regarding this from the Western point of view). This, at least in Western countries, is well known in politics and management, regarding the issues of personification of presenting, managing or being a politician. One main question than can be concerning the Chinese situation, do Chinese people/audience (consciously) realize stress embodied by someone on the panel or in a stress situation and what is the unconscious reaction of stress in a Chinese setting? And how does the audience experience this? Maybe they are used to it and showing some stress reaction seems to be normal or unimportant concerning the impression of body-language. It might also be that stress as a social or communicative phenomenon is not yet judged as relevant in China, relevant for the effects of communication.. One might get the impression that the Chinese know about stress, know that stress can be a “partner on stage” but that is not so much relevant to think about it or to be respected as a critical factor in communication. There will be more specific examples of managers and their behavior patterns within the next days here!!!! !